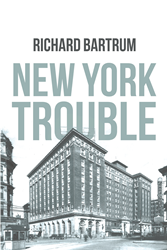 “New York Trouble” from Christian Faith Publishing author, Richard Bartrum, is an engrossing book that tells of a private investigator’s mission to take down an urban crime ring. “New York Trouble”: an action-packed story of a private investigator who is hired to thwart corruption and violence in a neighboring city. “New York Trouble” is the creation of published author, Richard Bartrum, a retired automotive industry employee who enjoys woodworking, hunting, and fishing. Published by Christian Faith Publishing, Richard Bartrum’s new book contains thrilling scenes of action and drama that will surely gain the readers’ interest and hook them up to every page. View a synopsis of “New York Trouble” on YouTube. Consumers can purchase “New York Trouble” at traditional brick & mortar bookstores, or online at Amazon.com, Apple iTunes store, or Barnes and Noble. For additional information or inquiries about “New York Trouble”, contact the Christian Faith Publishing media department at 866-554-0919.